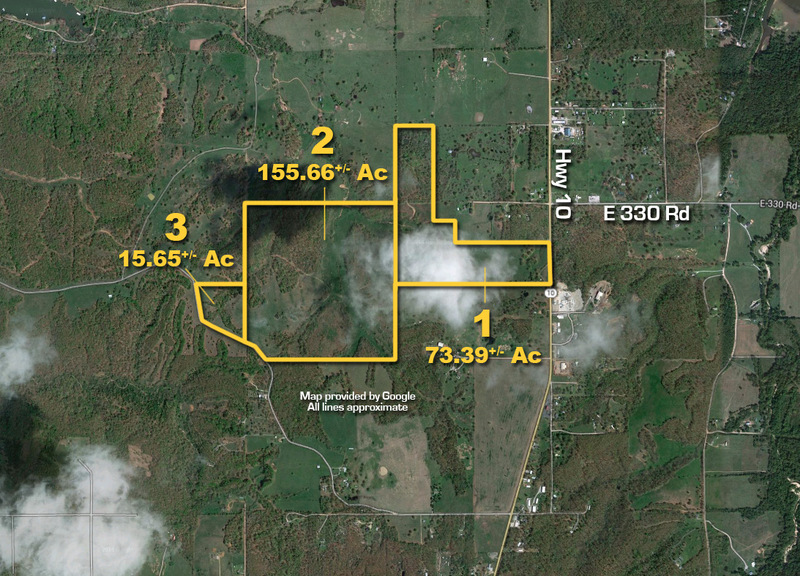 244+/- acres just minutes from Honey Creek Marina and the town of Grove, OK. Offers frontage on Hwy 10 and Number 8 Lake Rd. Great location for ranch estate or possible development. Land is fully fenced offering nice rolling hills, several ponds and a wet weather creek. Scroll down for link to property video. Registration at the auction confirms your agreement to the terms and conditions of sale as stated in the Contract for Sale and its Addenda (the 'Contract') which are incorporated by reference into your bidding. DO NOT BID unless you have registered, received a Bidder's Card and Sale Day Notes and have read and agreed to be bound by the terms of sale in the Contract as they are enforceable against you upon becoming a high bidder. All properties are sold "AS IS, WHERE IS" with no financing, inspection or other contingencies to sale. Williams & Williams represents the Sellers only and does not inspect properties on bidder's behalf. Read the Contract and Sale Day Notes to determine the existence of any disclosures, exclusions, representations and disclaimers. Do not bid if you have not inspected the property(s). By bidding you agree to all disclosures. A Buyer's Premium (Buyer's Fee in WI) of 3% ($2,500 minimum) will be added to the high bid and included in the total purchase price. Each high bidder must make a 10% ($5,000 minimum) non-refundable deposit per property immediately following auction. Cash, cashier's checks, personal checks and business checks (electronically processed) are accepted. If you are a resident / citizen of a country outside of the US, certified funds (bank check, wire transfer, certified checks) are required for the down payment and closing. The balance of the purchase price and all closing costs are due at closing. Closing costs typically include title exam, title policy, closing fee, filing costs and any other fees noted. Bidding starts at the nominal Opening Bid(s) indicated and is open to the public. The Auctioneer reserves the right to group, add to, delete, withdraw, consolidate or break down lots and/or quantities offered, to sell out of scheduled sequence, to reject any bid which is only a fraction advance over the preceding bid, to regulate bidding, to accept or reject any or all bids, and to cancel or re-schedule an auction. The Auctioneer will call the sale and control any increments of bidding. To make a bid, raise your hand or Bid Card to be recognized. The bidding usually takes less than 3 minutes for each property. Absentee bids may be accepted at the discretion of the Auctioneer and the Auctioneer reserves the right to enter bids on behalf of absentee bidders. Any mistakes during bidding as to who has the high bid and/or at what price may be called to the Auctioneer's attention and corrected. The Auctioneer is the sole arbiter and controller of the conduct of the auction and shall be the final and absolute authority without liability to any party. The auction is subject to court or seller approval. Buyers are not allowed possession until Closing and filing of the deed, at which time the property should be re-keyed. If for any reason the court or Seller approval is not granted, the Down Payment shall be returned in its entirety to the high bidder. "Showing" requests from Buyers after the auction may not be able to be accommodated. Williams & Williams and the Seller expressly disclaim any liability for errors, omissions or changes regarding any information provided for these sales. Please read the Contract and Sale Day Notes for a full and complete understanding of Williams & Williams and Seller's disclaimers. Bidders are strongly urged to rely solely upon their own inspections and opinions in preparing to purchase property and are expressly advised to not rely on any representations made by the Seller or their agents and employees. Property information may change without notice and potential purchasers should investigate all data fully before relying upon it. Williams & Williams serves as the auctioneer, and represents the owner of the property at auction. The auction and conveyance of each property shall be governed by property specific Contract for Sale, Sale Day Notes, Disclosures, and the Williams & Williams Terms & Conditions of Sale. These documents govern your bid and the sale of each property, and can be accessed and reviewed at the Williams & Williams property specific web page. DO NOT BID unless you have read the Williams & Williams Terms & Conditions of Sale, the Contract for Sale, Property Disclosures, and the Sale Day Notes for each property. BY PLACING YOUR BID, YOU AGREE TO BE BOUND BY THE PROPERTY SPECIFIC CONTRACT FOR SALE, DISCLOSURES, SALE DAY NOTES, AND THE WILLIAMS & WILLIAMS TERMS & CONDITIONS OF SALE. You are registering to bid on the following properties, and as stated above, your bid, and the sale of the property, will be governed by the property specific Williams & Williams Contract for Sale, Disclosures, Sale Day Notes, and Terms & Conditions of Sale. Each of these documents are available for your review at the Williams & Williams property specific web page. DO NOT BID unless and until you review these documents. BY PLACING YOUR BID, YOU AGREE TO BE BOUND BY THE PROPERTY SPECIFIC CONTRACT FOR SALE, DISCLOSURES, SALE DAY NOTES, AND THE WILLIAMS & WILLIAMS TERMS & CONDITIONS OF SALE. Survey fee $900 per parcel paid by Buyer.